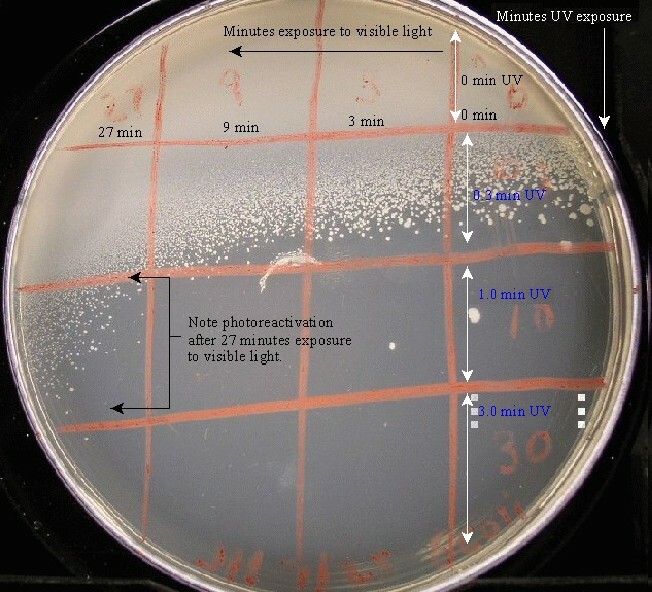 See Ultraviolet Killing of Bacteria and Agar Overlay Technique for techniques used in these experiments. 1. Prepare a seeded plate by pouring 2 mL melted and cooled top agar which has been inoculated with 0.1 mL ON culture of bacteria to be tested. (see Agar Overlay Technique ) Mark with a 16 square grid. 2. Label the four crossing lanes with the exposure times to UV: 3, 1, 0.3 and 0 minutes. 3. Label the four vertical lanes with the exposure times to visible light: 27, 9, 3 and 0 minutes. 4. 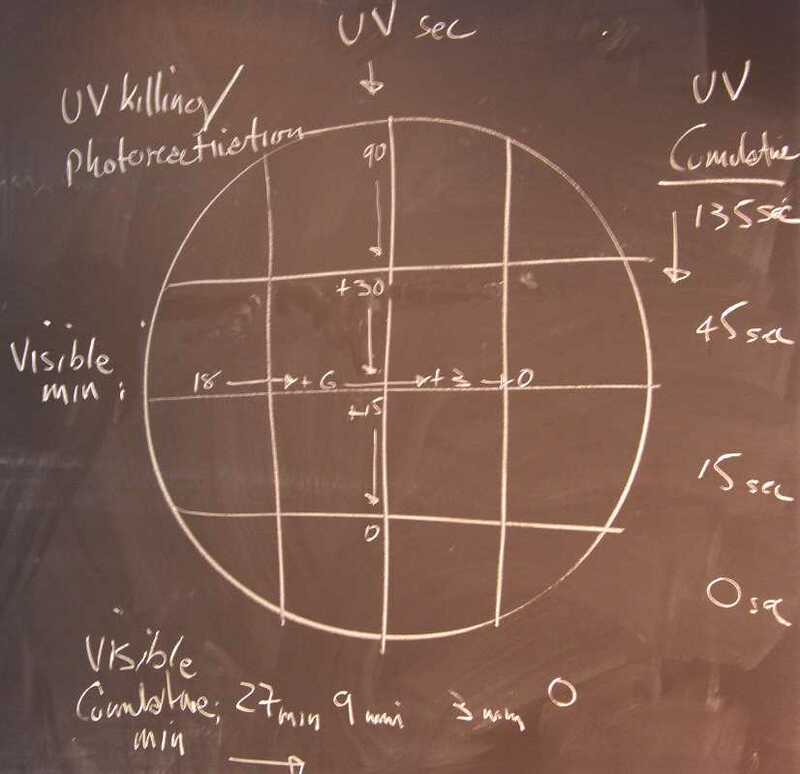 Expose the plate to UV according to the labeled times as directed on page 1. 5. Rotate the plate 90, expose to visible light, covering all but the 27 minute band with opaque cardboard, place under a bright visible light (glass-filtered sunlight, or 100 watt bulb at 25 cm) for 15 minutes. 6. Move the cardboard to expose the 27 and 9 minutes bands for 6 more minute. 7. Move the cardboard to expose the 27, 9 and 3 minute bands for 3 more minutes. 8. 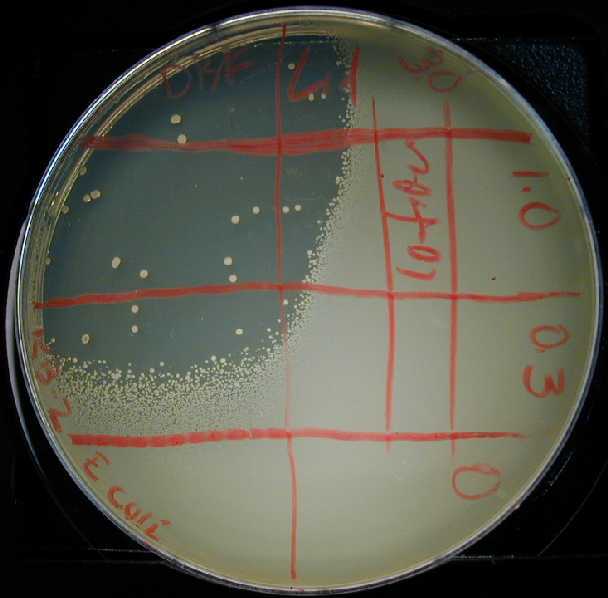 Incubate at 37C in the dark for 24 to 48 hours, note any difference in populations in the agar overlay. Propose a mechanism for any differences observed. Paint bands of several suntan lotions of given blocking powers across the top of a plastic petri dish. Pour a top agar layer of E. coli on top of nutrient agar plate. Expose the plate as above to 0, 1, 3 and 9 minutes. Note any protection which may be observed. TEST THE BACTERIOCIDAL EFFECTS OF TANNING BEDS? Shortly before going to a tanning saloon, prepare a nutrient agar plate with a fresh lawn of E. coli in top agar (step 1 above). At the tanning bed, cover the open plate with blocking cardboard, expose for 9, 3, 1 and 0 minutes as directed on page 1. Incubate ON and read bacterial density of exposed areas. Discuss the implication for your exposed skin for these times. Here are the final dilution tubes of a serial dilution. Note relative concentration. It allows for rapid achievement of a very high dilution factor. It requires a relatively small volume of diluent. 1. Equal measured volumes of diluentare placed in each of a labeled series of test tubes. 2. A small aliquot ofthe specimen sample is placed in the first tube and mixed. 3. A small aliquot of that dilution is removed with a fresh pipet and added to the second tube. 4. The second tube is then mixed, and an aliquot from it is transferred to the third tube in like manner. 5. The process is continued until the series of dilutions has been completed (a serial dilution). Notice that the concentration decreases exponentially as the dilution series progresses In the following example, the relative concentrations are 16, 8, 4, 2, and 1. Dilutions of antibodies orserumfor titering are prepared in much the same fashion. See handout on Dilutions for in-depth explanation of dilutions and sample problems. The handout on sterile delivery with pippettes describes pipette use. Illustrate the serial dilution process in your notebook with labeled tubes and volumes involved so that you fully understand what you will be doing before you begin the exercise. Turn on spectrophotometer to warm up. Set up your work bench with required equipment. Label the test tube with theoriginal solutionof methylene blue “16x.” Set up four empty 16 x 150 mL dilutiontubesin a test tube rack. Label the tubes 8x, 4x, 2x and 1x toindicate therelative concentration of dye which they will contain. Aliquot 3.00 mL of dH2O into each of these four labeled dilution tubes, using are pipet. Here is an alternative style repipet. 4. Push lever up to draw fluid above desired calibration line. DO NOT DRAW FLUID INTO BULB! 6. Press bulb to blow out last of the liquid from the pipet. Using the pipet bulb, transfer3.00 mL of the original 16x methylene blue solution from tube #16into tube #8, vortex #8 tube to mix well. (NOTE: If using a 5 mL pipet, 3 mL are contained when themeniscusis just touching the 2 calibration line. You should be leavingabout4 mL in tube #16. After vortexing, use a cleanpipet to withdraw3.00 mL from tube #8, add it to #4. Mix as before, using a vortex. Using a clean pipet, withdraw3.00 mL fromtube #4, add it to #2. Mix as before. Here the class isperforming severalof the stages of the serial dilution. Using a clean pipet, withdraw3.00 mL fromtube #2, add it to #1. Mix as before. When dilutions are done, 3mLshould remain in tubes #8, #4 and #2. Tube #1 should contain 6 mL. Read the A609 of each dilution against a blank of distilled water. Begin with tube #1,and work yourway up. 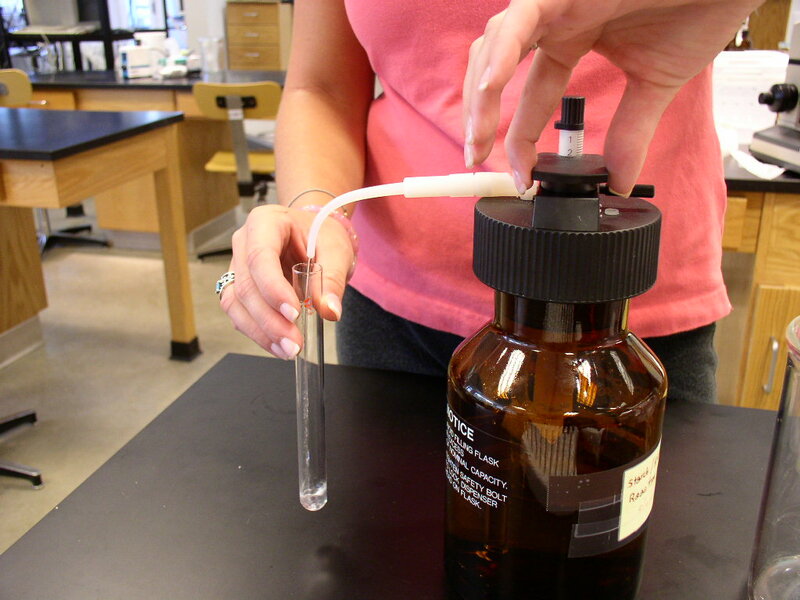 In this way, you need not wash the cuvette each time, but touch off the last drop before adding the next dilution. Plot a graph with the relative concentration of methylene blue(indicated by the tubenumber) as the ordinate (X axis) and absorbency at 609 nm as theabscissa(Y axis). Use the blank tube (zero methylene blue with an A609= 0.000) as your first (zero) point. 1Stock solution of methylene blueis 0.3%: Dilute it 0.166 mL into 100 mL in dH2O to produce ~A609of 1.000.